Well the scarf is, the tank I finished a couple of weeks ago and have worn it a few times since then. I love it, it is so nice and cosy and warm. I still need to buy some velvet ribbon in brown and black to thread through the holes. I did buy some satin ribbon in the same colour but have managed to lose it somewhere in the house. 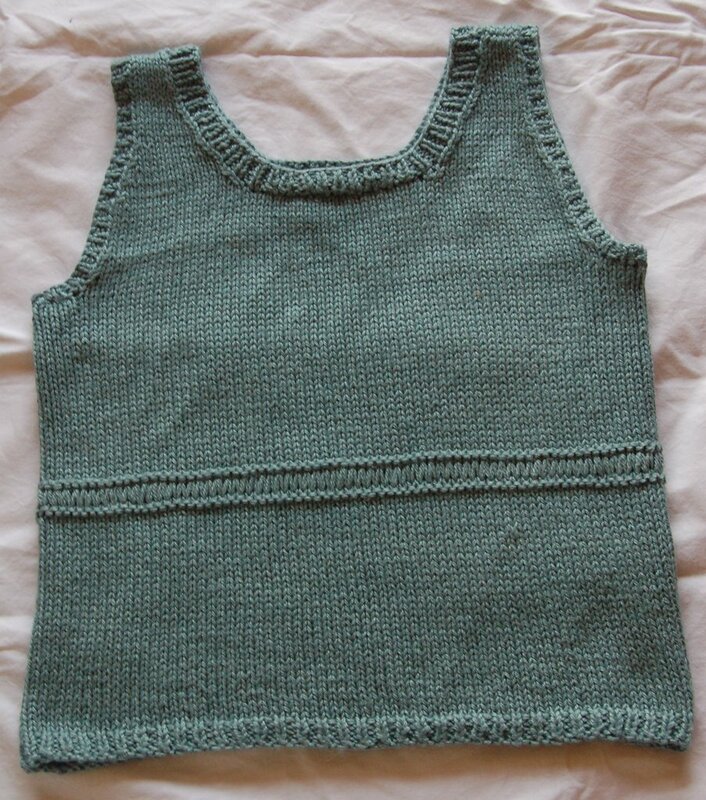 It is a Blue Sky Alpaca pattern knitted in Alpaca and Silk., which does smell kind of funky but it is gorgeous. When I was visiting London in the summer Yvonne gifted me a couple of skeins of the Alpaca and Silk and I loved it. After carrying it around for a few days, I sent her a message to see if she was going to be back to the wool shop any time soon. She of course was very obliging, picked me up the pattern and the rest of the yarn and posted it to me. I changed the pattern slightly to knit it in the round, as I was knitting in the car from the UK to here and I switched the seed stitch to a rib. I had a little leftover, enough for a skinny scarf which is very cute. The weather is doing some strange stuff for October and yesterday we ended up with the temperature over 25deg, it was t-shirts and sunglasses all round. Looks like it is going to be the same today too. The only problem being we have communal heating which is already on, so we have to have all the windows open or the apartment is completely stifling, bizarre! Today we are doing some family stuff, bowling apparently, I am not complaining as for some strange reason, only the teenagers know the answer, my boys are getting along, sshhh, I am kind of scared to mention it, in case they realise that they are no longer fighting, ALL the time! It is very strange, maybe its the weather! Great to see a picture of the finished object and I love the skinny scarf. Glasgow is wet and windy but the people are as great as ever, this has to be one of the friendliest shows I do. You’d love some of the bead work! Love the scarf, Yvette. Happy for your photograph of it, too. I had to click back and forth a few times, convinced that yours & Wendy’s were two completely different patterns. Love the color of the scarf and top, very nice! 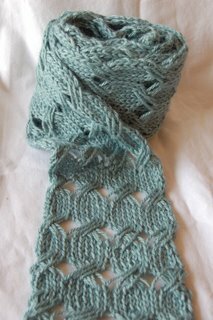 I absolutely love that scarf….I’m going to do a search fo rthe pattern, but failing in that, I’ll be back to ask your help in finding it. I haven’t been so enchanted with anything in a long while. The tank and scarf are so beautiful and I love the colour. Is that a Blue Sky pattern? I think perhaps I really need a tank like that….